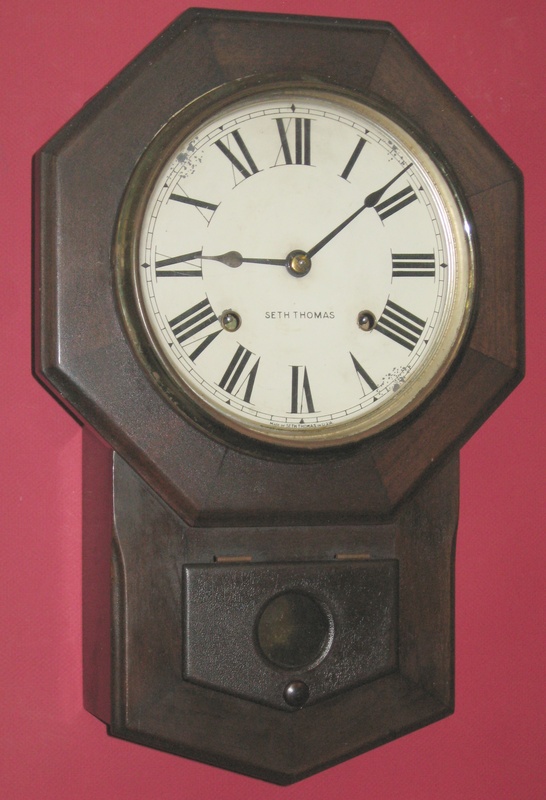 This Seth Thomas drop octagon clock is only 17 1/4 inches tall and 11 3/8 inches wide. 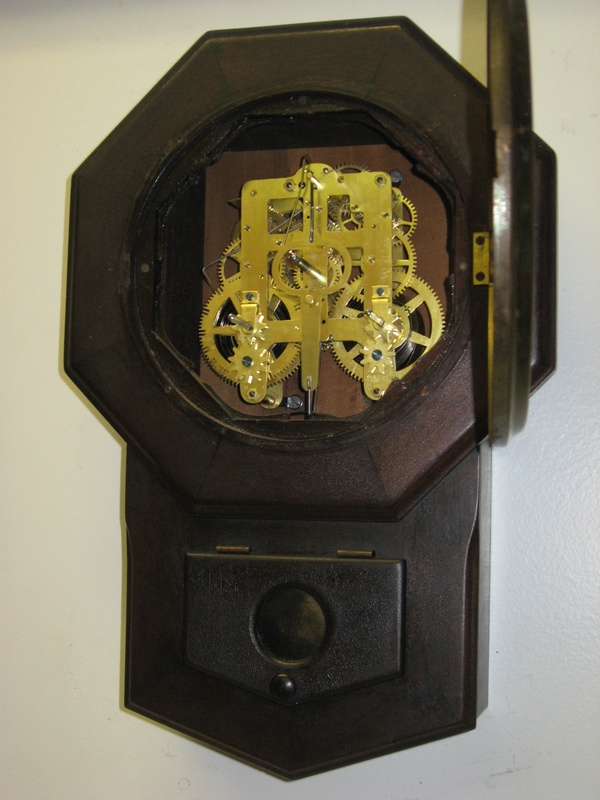 The dial is just under 8 inches diameter (many drop octagon clocks have a dial nearly 12″ in diameter.). The case is a dark mahogany color. The movement is a variation of the popular No. 89, called the No. 89B. It is an 8-day time and strike clock. 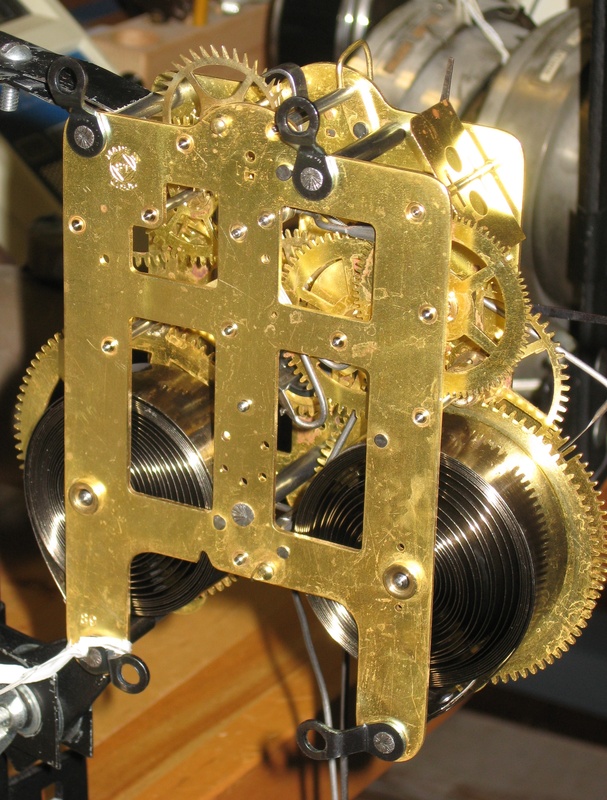 The movement has “stop works” to limit the mainspring motion to a portion of its range. Repair job 6354. I replaced the escape wheel (had some damaged teeth), polished the pivots and installed 15 bushings. When I checked the operation of each pair of gears, I found that T4 and T5 have a rough action. I tested them in the depthing tool and the action is rough at any depth. T3 and T4 are planted too far apart, but this is the original depth so I left it alone. In spite of this, the clock runs well, and the pendulum takes an excellent motion with the original mainsprings that are 3/4 inch wide and 0.0173 inch thick. I set the motion work to limit the mainspring winding to 1 turn from fully wound. If setup less then this, the springs tend to be unwound too far at the end of the running period. The minute hand is 3 15/16 inches long, and the dial’s minute track is 6 15/16 inches diameter.